Infants have the ability to manipulate an object in response to hearing certain songs. They also can differentiate between sounds, as well as recognize different melodies, which is why singing a lullaby to your infant can be beneficial. Music is hard wired in our brains at an early age. The ability to process music appears in specialized areas of the brain during the first few months after birth. It socially connects, communicates, coordinates and instigates neurological and physical movement, stimulates pleasure senses and hormones, alters perception, and shapes personal identities. Babies can hear sounds in utero starting at about 18 weeks — generally these are loud, low frequency sounds like their mother’s heartbeat and the rushing sound of blood moving through the umbilical cord. By 25 weeks gestation, the ear is fully formed and sounds outside of the womb, like the mother’s voice, can be heard. Even before birth, the mother’s voice, her speech rhythms, cadence and tone are learned by the infant and become associated with emotional attachment and security. Some professionals suggest parents repeat a song while their baby is still in utero in order to familiarize the child with a melody before birth. This may help the newborn relax and ease him or her to sleep. 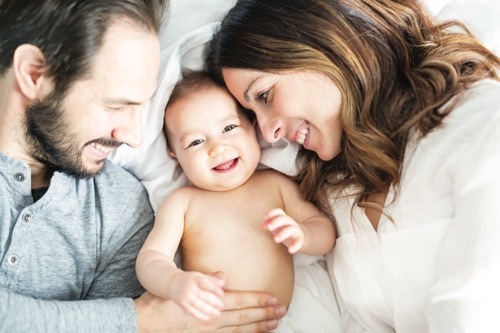 Lullabies reinforce the parent/child and child/parent emotional connection. They also stimulate language and cognitive development. Lullabies are scientifically proven to lull babies to sleep. As the parent sings, holds and rocks, and makes eye contact, the lullaby bedtime routine assures babies that they are safe and secure, allowing them to relax. At bedtime, the separation from a parent can be hard. The lullaby routine can help babies transition to a calm and soothed state. Hold your baby while you sing and rock to the rhythm, all while making eye contact. Use a soft and soothing gentle voice (no loud, animated singing). Don’t worry if you think you’re off tune — your baby doesn’t care! As they grow, continue singing and have the child sing along, too. Both parent and child can sing lullabies to a loved stuffed animal or family pet.